EAST LANSING, Mich. – It's difficult to count all of the factors working against Indiana when it took the court against No. 6 Michigan State on Saturday. The Spartans were undefeated at home this season. Indiana had lost 21 of 22 all-time at the Breslin Center. The Hoosiers were 0-7 against top 10 teams in Archie Miller's tenure. The Spartans had the biggest crowd of the season in attendance. Indiana had lost seven games in a row. On and on and on. Then, after the Hoosiers got off to a surprisingly good start and it looked like they may be able to hang around, Juwan Morgan went down with a shoulder injury. Game over, right? Apparently not. The Hoosiers scratched and clawed and battled harder than they have in any other game this season and emerged with the unlikeliest of victories, 79-75 in overtime, exorcising about a dozen demons all at one time. Just yesterday, Indiana athletic director Fred Glass said the program is in the middle of a "serious rebuild." That rebuild took a gigantic step forward tonight. It's unwise to attach too much significance to any one game, but the way the Hoosiers played, against a quality opponent with everything on the line and one of their two best players languishing on the bench, is the first sign in a while that this team might eventually get to where it wants to go. 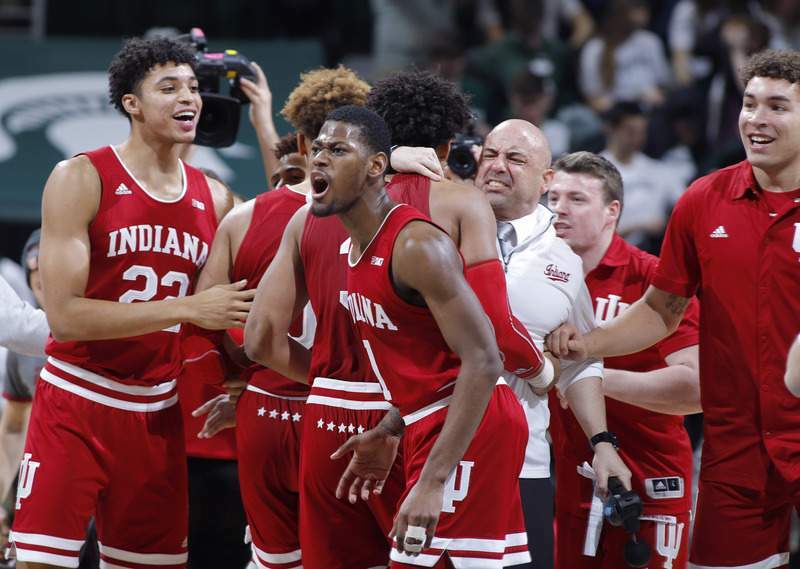 The seven-game losing streak derailed Indiana's Big Ten title hopes, but all of its other goals are still in front of it. If it plays like this more often, those goals – a deep run in the Big Ten Tournament and an NCAA Tournament berth – will be well within reach. After the game, De'Ron Davis struck a defiant tone. "I feel like this league doesn't respect us," said Davis, who had 12 points and six rebounds in a season-high 25 minutes. "Even though we started off hot and now we're cold, the league doesn't respect us, the (other teams') coaches don't respect us, so we've gotta have a respect from our coaching staff, our team. I feel like this win opened us up and now we've just gotta continue to go." Davis might end up playing an outsized role in Indiana's fortunes going forward. The severity of Morgan's injury – which came during a scrum for a loose ball on the same shoulder on which he has previously had surgery – is unknown. If he's out for any length of time, the Hoosiers will need Davis to do what he did tonight: bang down low, provide post scoring and tough rebounding and generally be an enforcer against the Big Ten's talented bigs. For the first time all season, it looks like Davis may be able to fulfill that role. He went toe-to-toe with the physical Nick Ward, who refused to give an inch in the pair's battles in the post. It's unclear if the 6-foot-9 Hoosiers center is 100 percent, but he looked close to it tonight and played 25 minutes without appearing winded, an impressive feat after missing three games. If Morgan is out, however, he'll still be a huge part of Indiana's leadership going forward. Even today, he was on the sideline in the second half, providing emotional support and acting as a de facto assistant coach. "Juwan's a big part of our team and he's a great leader," Davis said. "Honestly in my opinion it felt like he was still out there because every time we came back to the bench, he was talking to us, especially me, telling me to keep going, telling me what the defense is, what I need to do with Nick Ward because he's a big guy. Just because he was out, he wasn't really out." Perhaps the most important stat from this game for Indiana is the 10-for-20 mark in 3-point shooting. The Hoosiers went 7 for 10 in the second half and overtime from beyond the arc, erasing five games of abysmal shooting from deep. Maybe it really is that simple; when this team is hitting from the outside, it's really good. When it's not, offense and wins are hard to come by. The Hoosiers moved the ball much better than they have recently and assisted on 21 of 28 made baskets. It was pretty basketball for much of the game. "It's just amazing when a guy makes an unselfish pass or a correct read on a drive or one more pass when a guy's open or he reads the ball screen and delivers it," Miller said. "It's amazing how those balls go in. It's amazing how the other balls don't go in when there's absolutely zero chemistry and the ball just does not move the way it's supposed to move. I think we're a better-shooting team than we shot. ... If the ball isn't going in, especially from deep in this league to keep people honest, it's really hard to score." Just eight days ago, after a disheartening loss to Michigan at home, Miller called his team "soft" among other choice words. He said he saw a different team today. Maybe the Hoosiers will be a different team from here on out. This is the kind of win that makes anything seem possible.